00:01 – Intro and theme tune. 00:32 – Greetings, yes? And introductions from the team. 01:07 – Where is Keith? 02:24 – Introduction to… The Taste Of Doom! 03:46 – History Today – Where did Staggering Stories come from? 06:29 – Machete throwing and The Head Of Pertwee! 07:15 – Crumbly’s BIG mistake…. 10:35 – From Private Lives Number One – How to be Paul Cornell at the Fitzroy Tavern. 13:12 – The Taste Of Doom 1. 18:50 – The Revenge Of Tony – Mumptastic! 22:16 – Doctor Who 2007 and the Saxon Prediction of Adam! 27:16 – So here it comes, The Sound of Drums! 33:40 – Is he mad, gone back in time or on location? 36:01 – Last of the Time Lords. 40:51 – The Infinite Quest. 49:10 – Tony’s prediction for Doctor Who 2008 – Cue Cliffhanger!! 49:26 – The Taste Of Doom 2. 50:52 – Babylon5 – The Lost Tales. 60:58 – The Taste Of Doom 3. I survived Star Wars: Celebration Europe! Many didn’t, those Stormtroopers would as soon shot you as pose for a picture! No, not really – I wasn’t aware of any deaths at this convention. The fun really is going out of these events these days! Joking aside, it was pretty good fun. If far too packed on the Saturday and Sunday. The number of attendees on Friday felt about right for a venue of that size. On Saturday it was heaving – I seriously doubt they were within fire regulations on that day. If there had been an emergency people would have been trampled to death, I am quite sure. As I said, though, no such excitement for us this year! Lots of people in various Star Wars costumes, with a big presence (for a European event) of the 501st Legion (occasionally I’d see a group of seven or so Stormtroopers partrolling the interior perimeter). 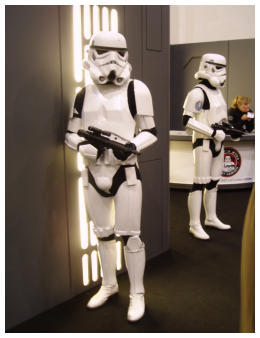 I really must get myself one of those costumes – if only I weren’t a little short for a Stormtrooper! I used to really enjoy getting into the old Doctor Who costumes (notably the Sea Devil and Voc Robot) and menace the general public! Those were the days! I’d love to create a Mk. 1 Tonb Terak costume some day (basically a variation on a Mandalorian body armour with a modified and grey resprayed Biker Scout helmet). The main events were really happening on the Celebrity Stage, though. There Warwick Davis (Wicket the Ewok) acted as MC for various interviews with cast and crew from the Star Wars films. It mainly concentrated on the original (and best!) trilogy, though the chaps who played Darth Maul’s body (Ray Park) and child Boba Fett (Daniel Logan) were about for a panel each. Mostly it was behind the scenes chaps, though. At least one of those was on three panels, another on at least two. Basically they seemed to be a little short of ‘celebrities’ for this stage, all but the ‘big name’ actors doing double or triple duty to fill in the schedule. That was a bit of a shame, not that these chaps weren’t interesting but a bit more variety would have been good. Some big names I saw included Mark Hamill (very entertaining), Billy Dee Williams (a touch worthy), Anthony Daniels (right up himself) and Rick McCallum (not quite as smarmy as I was expected (but close!)). All in all a corporate event (though not particularly well organised) but it wasn’t nearly so money grabbing as I expected. Besides a £6 glossy programme guide, they got not a penny more from me, I’m glad to say! Not a fantastic event but not a bad event either. If they sort out some of their organisational issues it might even be worth attending again next year. Last weekend was LUGRadio Live and next weekend is Star Wars: Celebration Europe. It’s a busy and expensive month, yet again! LUGRadio Live 2007 was a two day event, up in Wolverhampton, organised (with a lot of help from fans) by the chaps behind the LUGRadio linux podcast. As ever this wasn’t a corporate event, this is run for Linux and Open Source fans by Linux and Open Source fans. This is the third such event now, the first (two years ago – it’s an annual event!) was only the one day. Last year it became a two day event and this year carried on that format. Unlike last year I decided to only do one day this time. Most of the significant (to me, at least) activities were happening on the Saturday, so it was an easy choice between that and the Sunday. It was, as ever, a good event. It felt like a similar number of people as last year, perhaps a handful less, certainly not another big jump over expectations as the last two years have given with attendee numbers. It appears to have found its level in that regard. I doubt the torrential rains over most of the past month helped attendance any. Ironically that weekend was the most sun we’ve seen in what feels like months! Anyway, I’ll be doing a proper write up for the next Staggering Stories Update (due 23rd of July). In the meantime I just want to lament the loss of another LUGRadio presenter. A few weeks ago, founding LUGRadio team member, Matt Revell, announced he was leaving the show. Now another member of the team, Ade Bradshaw, has announced his retirement – live on stage. In fact I wasn’t quite sure what he’d said at first and I don’t think I was alone. As I recall, it wasn’t until Aq complained about our lack of reaction that I really knew what I thought I’d heard was true! Oh no, not another one, was my immediate thought. Both Matt and Ade have cited lack of time as the reason. As someone who every few weeks must do a Staggering Stories Update I think I know how they must feel. In my case it isn’t so much the amount of work (though that can get to me at times) it is more the unrelenting schedule – even if updates are a month apart, as these days, the constant beating of that drum does get to you! It also makes me wonder about our own podcast efforts. Right now, for me at least, it isn’t too demanding – the evening before the recording I shift kit around and setup. Then there’s the evening of the recording. Then an evening of listening to the result (and listening to it at least twice more before the update, once to check the MP3 encoding and once for the Ogg Vorbis version). It’s certainly a lot tougher on Tony, who is right now editing down the second podcast. LUGRadio is every two weeks, we are a once a month podcast. Will once a month get to us as their fortnightly ones have? Unlike the LUGRadio team, we don’t have any obvious pool of replacement people. We’ll just have to see how it goes. But back to those LUGRadio chaps. Both Matt and Ade will be missed. When LUGRadio returns after its summer break it may feel like quite a different show. Probably no less entertaining but not quite the same, nonetheless. Hopefully there are no extra fees in regards to any of these stages – being a George Lucas inspired event I wouldn’t be surprised! With luck I will be able to blog sometime over the weekend to give you my initial impressions. May the mysterious sauce be with me! Well, we recorded our second podcast this evening. Purcell-face had spent a small fortune on new recording equipment so things should sound better…I say ‘should’…. I’ve yet to hear it back properly, but the indications are hopeful – the less said about the duff lead, the better, lol. It did seem a little less dynamic, this time around and I think we can put that down to the fact we were rather tired tonight. (I know for myself Im effing knackered – early start, gym visit etc…takes it out of you, you know…). As it is, we ended up with approx one hour fifty one minutes worth of material that I’ve now, somehow, got to shrink to an hour, max! With luck it should pick up the pace considerably. Do feel free to post your opinions about the podcasts, yeah? or suggest things for us to talk about. So far no one has replied about it which is, tbh, a little disheartening.